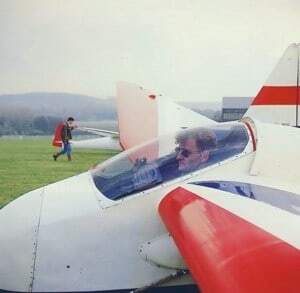 Photo Descriptions – ‘Budgie’ 011 on its trailer; the wing overhangs the car roof and note also that the angle of attack is held so that sidewinds do not make it lift. Wing structure (right) is conventional with a sheeted ‘D’ box and open structure on the outer wing panels. A small amount of sag is visible between the ribs. The history of the AV36 goes back to the 1930’s. 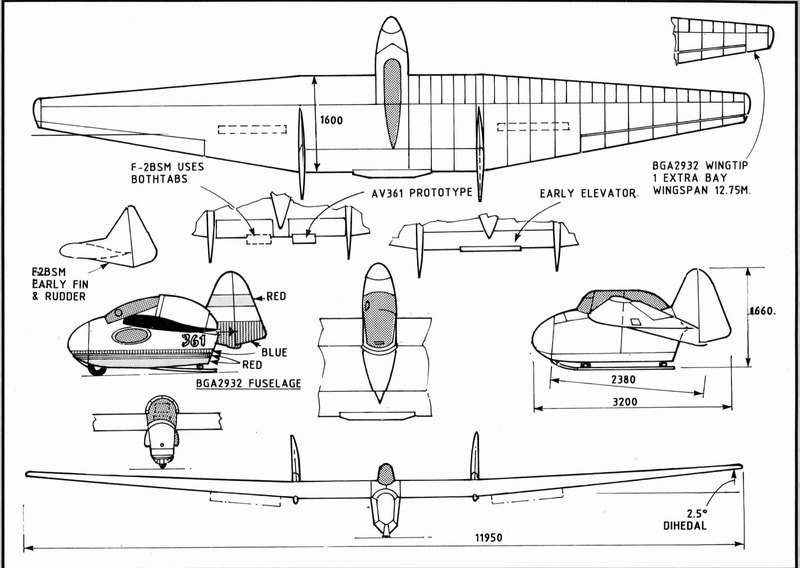 The main tailless (Aile Volante) type of the time was the swept flying wing, the Horten wings being classic examples. However, their construction requires care, an excellent structure and a great deal of complication. 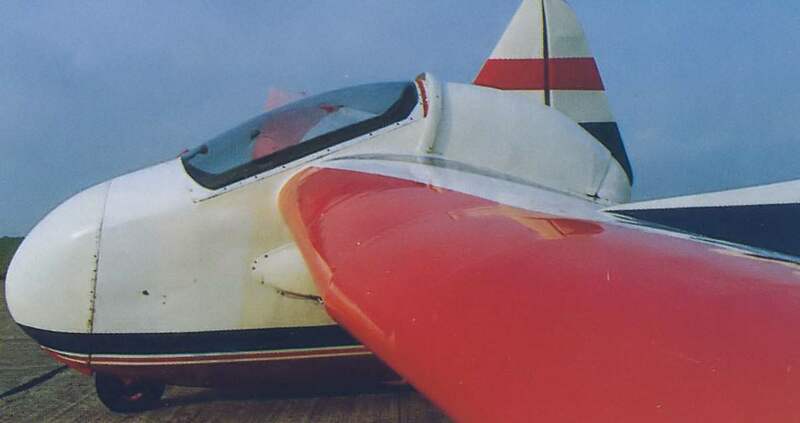 Charles Fauvel decided that it was possibl e to make a simpler and structurally less demanding aircraft by using a straight wing with an “Autostable” aerofoil , in other words, a reflexed wing section . The resulting aircraft, the AV3 used a constant aerofoil, no washout, a conventional wing planform and standard controls. There was also a small touring aircraft with a 75 hp Pobjoy engine, the AV10 . This broke a world altitude record in 1938 but ” disappeared” during WW2. Instrument panel; some of the instruments have been changed over the years. 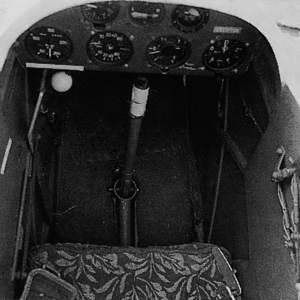 Left side of cockpit. Inspection panel under the wing root covers one of the towhook release mechanisms..
Upper left : Jeremy Beringer prepares for launch; tow yoke is just visible under the wing. 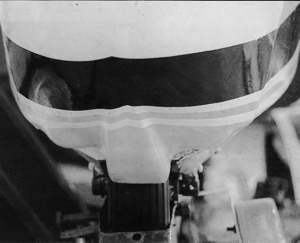 Left: Rear of fuselage; note the fairing shape, trim tab and fin strake. 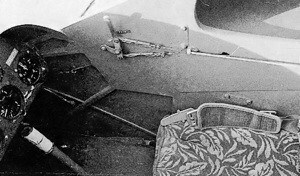 Right hand side of cockpit showing the trim lever, homely upholstery and internal structure. AV36 in the hands of a pilot new to the type overshooting on landing approach . The AV36 came about because Charles Fauvel’s son , Jean , who was a student at the time, wanted to build his own glider. The father drew up the general design and the son drew up the 17% thick F2 ribs and started partial construction in 1948. The building programme was moved to Cannes and a small subsidy was found to assist matters. 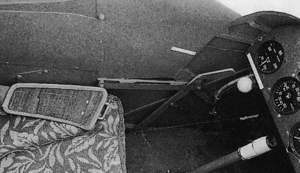 The prototype was extracted from the first floor of the joinery on the 30th of December 1951 and test flown the following day . It encountered no difficulties on the winch and showed itself to be a capable sailplane. The design proved itself to be as good as the Weihe’s and Air 100’s of the time. In addition it was economical in construction and hangar space. 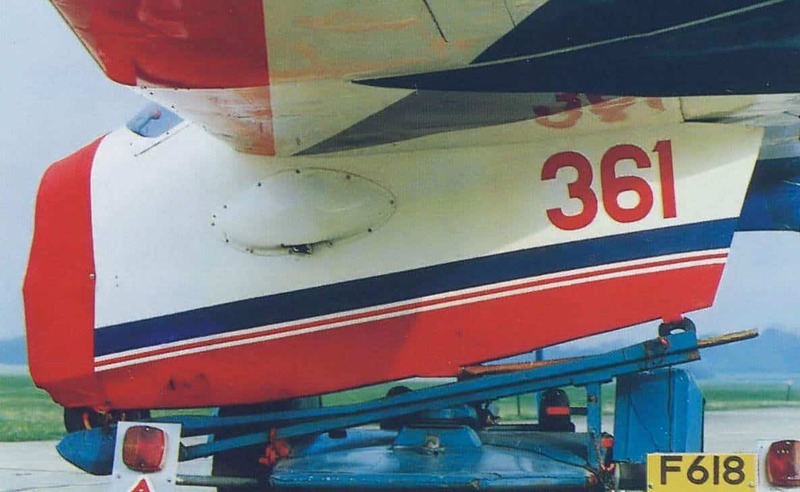 Road transport is easy, the nose cone is removed, the rudders folded back and the whole aircraft is mounted on its special trailer. The width is only 2.37 metres on the trailer. With such obvious advantages this glider had to be a commercial proposition. Kits were prepared in 1953 and around 100 AV36 kits were sold to 14 different countries. More AV36’s and AV361’s were built than any other type of tailless glider, several are still in airworthy condition. Th is popularity pos es considerable difficulties for the scale modeller because there really is no definitive vers ion of the air craft; many local pract ices, preferences and expediencies were built into the AV36. The items to watch out for are the canopy and the shape of its fairing, the rudder and fin strake shapes, the elevator and its trim tabts). the skid and the wingspan . In other words you need extensive photos and/o r access to the orig inal to be certain of the accuracy of on es model. It seems th at there was a transit ion period when features of both the earlier and the later model, the AV 361, were present. 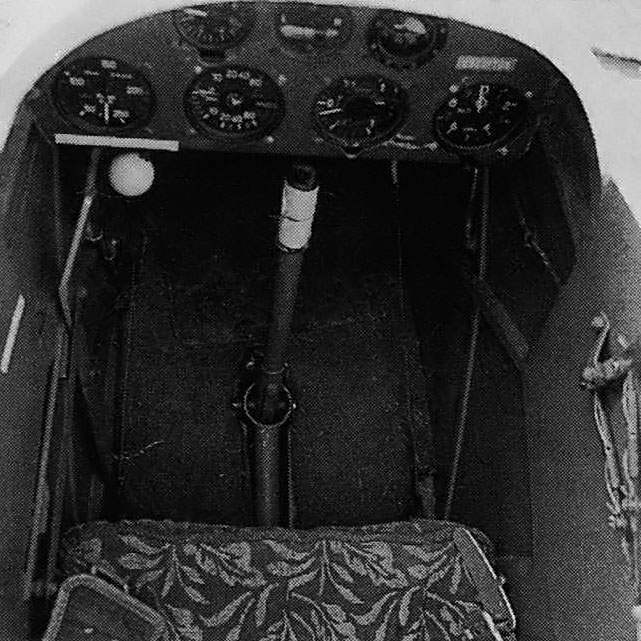 ockpit shows evidence of long service; airbrake lever, marked ‘Landeklappen’; is on the left. Note the two-position notches. 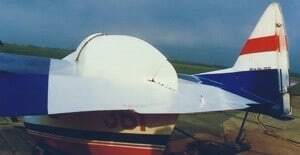 Underwing area; note the towhook fairing, inspection hatches, the fit of the spoiler, shape of the bottom of the fuselage and the clearance for the elevator. Fuselage side view; note shape of nose, canopy and fairing. BGA 2932, the subject for this feature, was built in Germany in 1956, at Hermann Frebel Flugzeugbau at Naberni Teck and is called an AV36 cr . The aircraft today shows features of both the early AV36 and the later AV361 . The 3 view drawing, dated 15/7/1955, shows the distinctive trim tab, fin, rudder and rudder strake of this aircraft. (The rudder strakes also appear on the later AV361 , although the fin and rudder shapes are different). 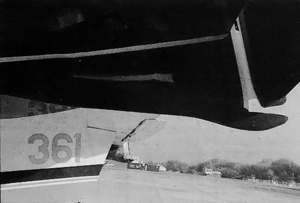 It was registered to the Deutsche Aero Club and was modified in 1959 when an extra 400mm of span was added at each wingtip , outboard of the existing aileron, the German drawing for this modification exists and is dated 8/1/ 1959. This increase to 12.75 metres span anticipates the new span of 12.78 metres on th e AV 361. 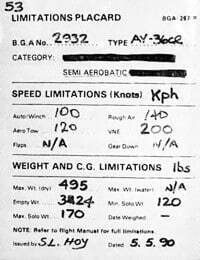 The ai rcraft was taken onto the RAF list at the end of March 1973. Jeremy Beringer bought it in April 1982 and the current syndicate took ownership in April 1991. The canopy and fairing was altered some 4 years ago to its current shape. Fauvel F2 17% aerofoil, penultimate rib to tip rib – traced from the original full-size plans. AV361. BGA 2932, or “Budgie” as it was affectionately nicknamed, has the later nose wheel and skid, the original 1955 three view shows the old layout. The distinctive “boundary layer generator” was on the aircraft when it was brought to England in 1973. 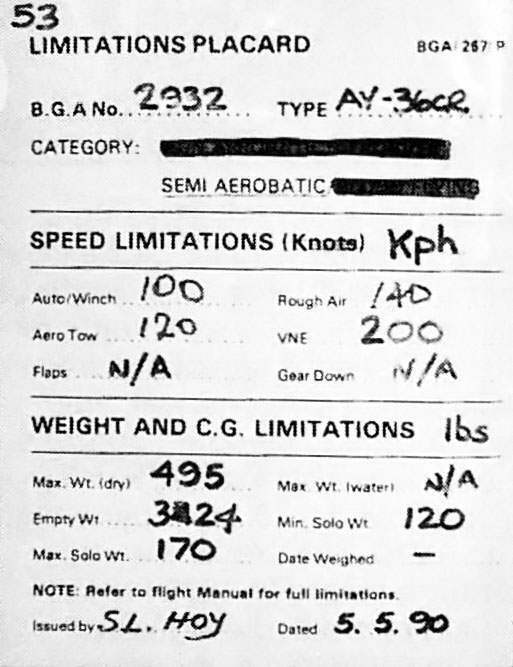 This is a device that ensures that the fairing does not cause turbulence over the elevator, apparently a cause for some grief on early AV36’s . Bottom of the nose cone moulding; note the wheel fairing and the bulges either side for the rudder pedals. The issues become clearer in the AV361 which first flew in 1960. All the cumulative expe rience seems to have been incorporated into the ” new” desig n. The elevator is a two piece arrangement, the canopy is a blown bubble type, the ailerons are longer (they go out to the tips) and Schempp Hirth type airbrakes are fitted . The boundary layer generator appears to be absent. Plans for th e AV361 were available and it may be possible to track some down. 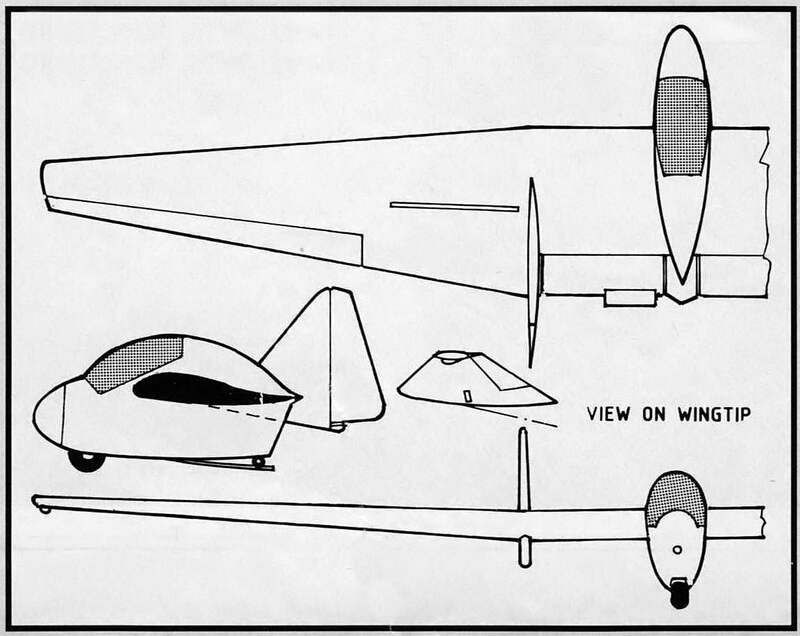 Further aircraft include the AV 45 and AV451, a motor glider essentially similar to the AV361 but w ith a wider centre panel and Hirth engine driving a pusher propeller. This might make an interesting electric powered scale machine? There is also the AV222 motor glider of 1965 but that is a substantially different aeroplane. Flying ” Budgie” was regularly flown at RAF Halton, although only experienced pilots are allowed to fly it due to its rarity. The AV36 is a strange sight in the air, although it must be said that it looks good from most angles. Sometimes it looks like a butterfly, sometimes a bat, on the winch line it does not look feasible. In flight it has a sort of determined look to it, as if it is on rails and not much is going to deflect it from its chosen path . Underside view showing the fin strake; the shape is complex. The rudder has a hinge seal made from tape. Finish of the aircraft is almo st glossy. The launch is uneventful, a specia l Yshaped tow yoke is used , but this does not seem to be critical. A recent launch was made with only one half of the yoke connected and the asymmetrical pull was not noticed by the pilot. The flying qualities and handling are good. The elevator control is said to be ” different ” but not difficult. The spoilers on the undersideof the wing act as ” draggy flaps ” . They are used half open (45 degrees) for Aerotowing and fully open as airbrakes . Their action is different though, the aircraft is brought in lower than usual. The spoilers are deployed and the speed allowed to drop off, the aircraft then tends to float in on the flap effect . When the skid touches down the brakes are retracted and the aircraft sits onto the ground as the extra lift is removed. Jeremy Beringer, the usual pilot, can land it accurately, but pilots new to the type tend to end up 200 metres down the airfield. The spoilers have little effect on pitch stability. The AV36 is aerobatic, there is a video of ” Budgie” being thrown around, the loops were tight as one might expect with such a layout. It is good in lift as its low wing loading would suggest, but the cross country performance is limited compared to current aircraft. It is also a tiny aircraft and not comfortable if flown for protracted periods, three hours is said to be as much as is bearable. When trimmed for cross country flying it is reported that there is a gentle pitch oscillation, a common observation on flying wings and perhaps one reason why they were not adopted for commercial aircraft. ” Budgie ” was owned by the syndicate of Jeremy Beringer, Richard Clark and Colin Watt. 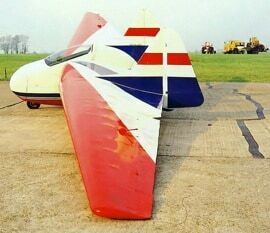 It was one of the 20 or so Vintage Gliders flown by the London Gliding Club. Flying report from Derek Piggot.